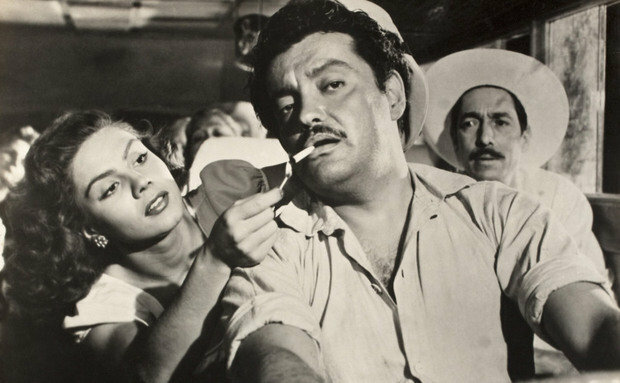 Even though it may initially seem one of the least impressive of Buñuel’s works, Subida al cielo (American title: Mexican Busride) is more than a footnote to his career. The story itself is simple and obvious enough. Oliviero, a young man in a relatively primitive village which has no church, gets married, but his honeymoon is interrupted when he must travel to a distant town to arrange his dying mother’s financial affairs for her. The journey itself has frequent interruptions, including the seduction of Oliviero by the flamboyantly sexual Raquel—who is not his new bride—but he eventually saves his mother’s money from his conniving brothers and returns to begin his honeymoon voyage once again. On the basis of such a description, it is easy to be skeptical about the extent and depth of Buñuel’s contribution here. We can be pretty sure we’re in his territory when the brand new bridegroom gets a glazed look in his eyes and lapses into a dream filled with sexual confusions. But beyond that, the film seems largely a sort of peasant drama, full of simple emotions and assumptions. And perhaps most distressing of all, to a certain frame of mind, is the general absence of any evidence that Buñuel himself, as director, is trying to subvert these routine materials with contrary implications of his own making. Be that as it may, Buñuel’s presence is definitely felt in Subida al cielo; and while that in itself only partly justifies a more generous appraisal of the film, a knowledge of Buñuel’s filmic inclinations can help open up a sense of the movie’s complex of tenuous little ties with the mainstream of his work. To begin, although it may come as a bit of a surprise to find Buñuel busying himself with an “entertainment,” there need be no great shock over his participation in a film that is sympathetic to kinds of people for whom he has shown concern both before and after this particular effort. Even more, though, there are the glimpses we get that strike sparks in this film because they resemble choice moments in other Buñuel works. The opening establishing shots and narration may evoke Las Hurdes; a cripple with a wooden leg is a relative of countless dwarfs, cripples and mutilated folk in the Buñuel canon; a “magical” little girl who leads some “stalled” oxen out of the river is one of several in Buñuel’s oeuvre about whom hovers a special aura; her subsequent reappearance as a corpse transported in a coffin harks back to the dying and dead children in Las Hurdes; the inclusion of sheep and goats as passengers on the bus is nicely suited to the work of a man who has almost always taken care to preserve the animal element in his film world; the deposed landowner and the gun-toting politician elicit bits of the bizarre humor which Buñuel tends to reserve for the emissaries of material wealth and social esteem. And there is the dream, a latterday cousin to Un Chien andalou. All of these are perhaps very nearly invisible without a definite familiarity with the director’s output, but they still serve as guideposts to Buñuel’s interest in the film—if not always yours or mine. Yet in Subida al cielo there is finally nearly as much of the “personal” as of the “obligatory.” Though the film makes a broad and open appeal to what is implicitly an unsophisticated audience, it still deals in more than just the accessories of Buñuel’s vision. Ponder, for example, the “ascent to heaven” commemorated in the title: this perhaps refers in part to the two deaths in the film, or to its final honeymoon image of seascape and clouds, but it is most explicitly linked with Oliviero’s stormy busride alone with Raquel, over the mountain pass to Petatlán. Plotwise, this trip is somewhat a cliché ascent in that it merely leads to the resolution of the inheritance complication via some legal trickery. But along the way the bridegroom consummates his honeymoon not with his bride but with an unrepentant female Casanova, while the bus is parked just beyond a sign marked “the Gate of Heaven.” The acsent5, then, is a sexual one, and it leads to one of the film’s most surprising images: a striking, even though faked, shot of the bus parked on a cliff that is lit in such a way as to give the illusion of a large dark chasm gaping beneath the bus’s midsection. Inside a virtual heaven Oliviero consummates his marriage through adultery while suspended above an abyss in the violent darkness of a stormy night. The prominence given this scene by the film’s title suggests that this symbolic and very unusual ascent is not only a sexual climax but also the climax of the film itself. In short, in a movie that combines newlywed comedy with family melodrama, Buñuel has permitted a rupture of conventional morality to take place as a kind of triumph in the midst of events whose familiarity is in no way impaired by the rupture. In fact, one of the most interesting things about Subida al cielo is that this strange moment is so casually absorbed into the generally uninhibited movement of the film as a whole (only Oliviero shows inhibition, but this seems more of a tic than an actual barrier, a quirk of personality which is not permitted to impede the flow of life around it). Another oddly brilliant flash of recognition comes in the scene in which it is explicitly remarked that the bus has served both as maternity ward and funeral wagon on its journey. The deposed landowner, who has made much of his hopes of regaining his property, apparently agrees and quickly replies that “These are disordered times.” The remark is a casual one and Buñuel makes no attempt to underline it for our benefit, yet it is one of the film’s blinding little strokes of insight. Whereas the man’s pretentiousness earlier caricatured itself from without, this apparently sincere remark lacerates from within by showing that this ex-noble has no sense at all of the life-and-death cycle which the peasants grasp so fully. So much for possession of the earth. Similarly, Buñuel makes rather casual comic use of the pegleg cripple, yet the very presence of that figure in the film becomes one of its most penetrating features. There are men with wooden legs and there arc cripples, but this fellow is special: he has a wooden leg, but he is not an amputee; he also has the useless leg of flesh dragging along at the same time. He trips a little girl with the peg (another of the dark-humored bits of business that complicate and peculiarize Buñuel’s films) and he gets the peg comically stuck in the muck; and every time he goes past the camera, that crippled leg is hanging out like some anatomical aberration As such, that little man bears frequent witness to the insistently earthbound burden of the human flesh—and does so with a force that is all the more impressive for being at once grotesque and joyous. The dream scene is so flamboyantly surrealistic that it may seem to detach itself from the film altogether. Problems of overall tone aside, however, the dream brings into focus a number of themes which reverberate through the rest of the action. An apple-peel umbilical cord running from his mouth to the lap of his pedestaled mother suggests an Oedipal conflict, yet Oliviero’s smiling mother seems rather to approve of his dalliance with Raquel in their driverless, shrubbery-filled bus. And this feeling of the mother as sexual reinforcement is echoed, more or 1ess, in the case of Silvestre, the generously anarchic busdriver (on the rest of the trip) whose passion for his own mother appears free of guilt and perversion. The dream itself is initiated by Oliviero’s acceptance of an apple from Raquel, and if we are to understand that here the young bridegroom is another Adam eating again from the Tree of Knowledge, then the ensuing metamorphic sexuality of the dream may be a revelation of (and reveling in) the gospel according to Buñuel. In any event, with mother assenting and Raquel proving both irresistible and irrepressible, the dream mixes marital anxiety with extramarital ecstasy; and though the bride, preceded by her goats, manages to interfere with the ecstasy, the dream ends with a triumphant wink from Raquel, whose usurpation of the bride’s role is a prophetic victory for pleasure over propriety. Oliviero, meanwhile, awakens to find himself holding a sheep; he too is an earthbound animal. Both the dream and its immediate aftermath show that Oliviero is unable to resolve the conflict of his affections even as one woman is transformed into the other. But the subsequent sexual ascent inside the gates of heaven constitutes a kind of acceptance of the dream vision; and in the final moments of the movie, Oliviero seems to acknowledge a revolutionary trinity of his own as he stands with his bride by his mother’s body and calls to mind the image of Raquel (eating an apple and saying, “I got what I wanted”), the mother, the wife and the heavenly whore. This sense of sexual and moral liberation, of the female as godhead, and of truth as the actualization of dream marks Subida al cielo as at least partially surrealist in nature—not a complete surprise even though Buñuel was active in the surrealist group for only a few years at the start of his career. In this case it is most often a peculiar, strangely casual kind of surrealism. But then, a number of Buñuel films are very crude, very roughly made, and even the more polished efforts of recent years sometimes have an unusual offhand quality to them at significant moments. Given the whole of Buñuel’s career, one cannot simply write off Subida al cielo for its lack of polish or for its permissive, unemphatic approach to bizarre patterns within a predominantly banal surface. To some, Buñuel’s genius resides only in sliced eyeballs and elaborate blasphemy, and consequently the greater portion of his work can seem mystifyingly ordinary. But Buñuel the film author speaks an unusual language, to which his most shocking moments are not necessarily a good guide. A more useful key appears in Los olvidados when the severely victimized blind man comes face to face with a chicken. Where a humanist would seek some sort of image of sympathy, Buñuel radically disrupts our own tortured sympathies by showing us that the chicken is far more noble than this pathetically suffering man. It is toward this sort of wild visionary leap that Buñuel gravitates. Yet such leaps are less suited to sweeping movie visions of apocalypse than to earthy restructuring of banality itself. Apocalypse in the grand manner is not permitted in a world where a single chicken overthrows the anthropocentric sense of hierarchy in the animal kingdom; and readymade revelations are ill suited to Buñuel’s sense of disorder’s fertility. “A film,” he said in 1953, “is like an involuntary imitation of a dream.” Ultimately this means that the sensual stylishness of Belle de jour and the low-budget crudeness of Subida al cielo may be rendered equal by the emergence, from any quarter, of the marvelous: “…in all films, good or bad—and beyond and despite the intentions of directors—cinematic poetry struggles to come to the surface and reveal itself.” Working in these terms, one might make an interesting—and appropriately perverse—case for the superiority of Subida al cielo to Los olvidados. But then there is yet another twist to the Buñuel problem: in Los olvidados the marvelous shows us its backside in the light of Buñuel’s dark brooding flame. But Subida al cielo remains an especially interesting film not only for its striking contribution to Buñuel’s career, but also because it demonstrates one of the ways in which surrealist values can take hold in a work of art which ostensibly lacks easily identifiable surrealist trappings. In his important book on Surrealism and Film, J.H. Matthews more or less evades the question of effective surreality in Subida al cielo and thus misses an opportunity to amplify his remarks on the surrealists’ interest in commercial cinema. As Matthews notes, surrealism is not only a way of making movies, it is also a way of watching them. The five marvelous minutes that Man Ray finds while “watching insipid films and highly praised ones alike,” the poetry that Buñuel finds “struggling to the surface,” are part of the process in which the surrealist sets his sensibility free, letting it move to discoveries and satisfactions profounder than the bonds of conventional (and rational) consciousness allow. In this respect, Subida al cielo is a film that partakes of two worlds, it has moments in it where there can be little doubt about surrealist intentions being at work, and yet its ordinary surface also permits its audience to react spontaneously, to find its pleasures where it will. In short, Buñuel’s little magic bus movie is art without aestheticism, surrealism without pretension. And as such it just may bridge the gap between lowbrow and highbrow more successfully than any of the films Buñuel ever made before The Discreet Charm of the Bourgeoisie. The Players: Esteban Márquez, Lilia Prado, Carmelita González, Manuel Donde, Roberto Cobo, Luis Acevez Castaneda.